Barbara Bush, the iconic First Lady of President George H.W. Bush and mother of President George W. Bush, has declined further medical treatment after a series of health complications, the family said today in a statement. "Following a recent series of hospitalizations, and after consulting her family and doctors, Mrs. Bush, now age 92, has decided not to seek additional medical treatment and will instead focus on comfort care. It will not surprise those who know her that Barbara Bush has been a rock in the face of her failing health, worrying not for herself — thanks to her abiding faith — but for others. 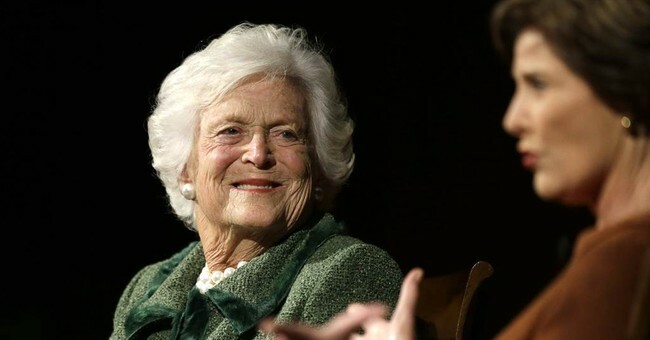 She is surrounded by a family she adores, and appreciates the many kind messages and especially the prayers she is receiving," Bush family spokesperson Jim McGrath Sunday afternoon. Barbara Bush and her husband have been married for 73 years. In 2017, President George H.W. Bush shared an old love letter he wrote for the love of his life on the Oprah Winfrey Show. In response to the news of the Mrs. Bush's decline in health, United Nations ambassador Nikki Haley sent her condolences to the former first lady, who has been such a role model for so many young men and women.